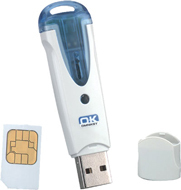 The portable OMNIKEY® 6121 is designed for SIM-sized smart cards. Carry the readerwith your credentials in your pocket or on your key ring and plug it into your PC via theUSB port to access your sensitive data. The reader is based on the same technology anddrivers as the OMNIKEY® desktop product family and is therefore just as easy to integrate into your application.The OMNIKEY® 6121 is designed to meet all major standards like ISO 7816, Microsoft® WHQL, USB CCID, PC / SC, HBCI (Home Banking Computer Interface), the PC-2001 specification and many more. Usage within an application is based on standardized interfaces like PC / SC, OCF(Open Card Framework) or CT-API. The USB CCID support makes integration intoan existing system simple by connecting host and smart card reader without needing additional drivers.